Antoinette Wilson and Jordan Osmond take a break from filming a story about sustainable living for their website, Happen Films. “It’s a lot more luxurious than it sounds,” says Antoinette Wilson, as a rooster crows lustily in the background. “You can do a surprising amount in 20 square metres. 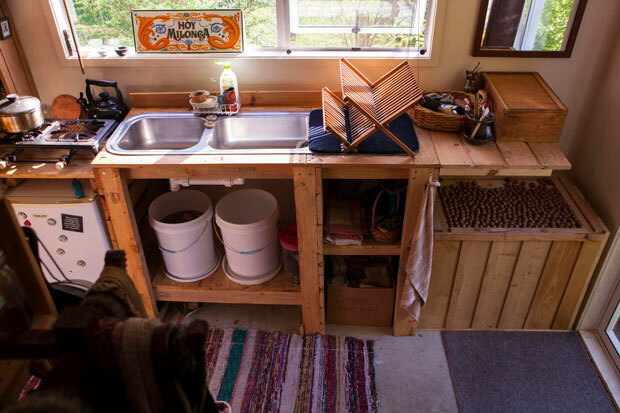 Jordan and Antoinette’s unplumbed kitchen is made up mostly from wooden pallets picked up from the side of the road. The work they do is reflected very much in the lifestyle Antoinette and her partner, Jordan Osmond, live every day. They travel the country meeting, filming and being inspired by New Zealanders finding innovative solutions to sustainability problems. The resulting short documentaries are then posted on the Happen Films website and YouTube channel. Come February those short films will be woven together into a feature, Living the Change. Living just outside Katikati on the lifestyle block of their financier-turned-farmer friend Andrew Martin, the subject of one of their films, their tiny home is tacked onto the back of a garage (all ablutions take place inside Andrew’s home, FYI). 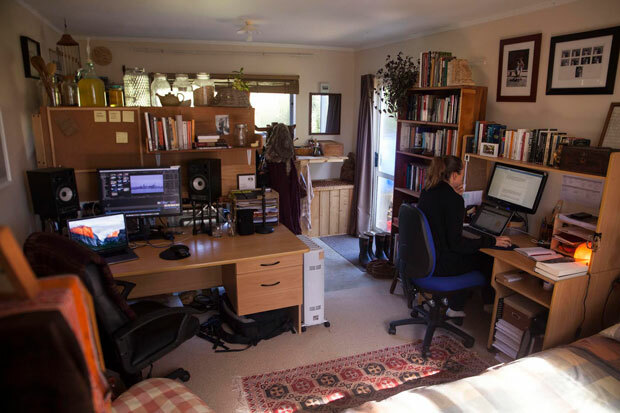 The combined sleeping and living space of the 20sqm would feel “palatial” to the couple if they didn’t also need to fit in two desks to do their work. This rural life is a long way from where Christchurch-born Antoinette was six years – but it is a direct result of it. She was a tango teacher in Buenos Aires. “It’s another life I sometimes forget I had! When I first moved there in 2004 I just loved it. But by the end, the tango lifestyle of going out at 11pm and in bed at 4am, not eating well and drinking a lot of alcohol, was making me ill.
At that time, a continent and an ocean away, Jordan was finishing school in Ballarat, Australia. Living semi-rurally, he loved bushwalks and taking photographs of wildlife. One day his teacher showed Bowling for Columbine, and Jordan was hooked on documentaries as a powerful medium for storytelling. 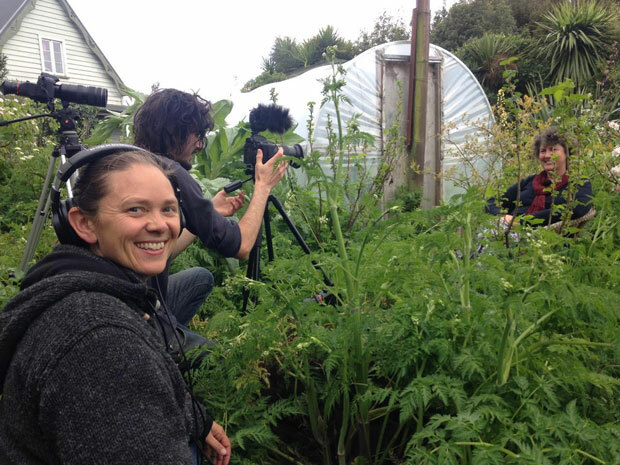 The self-taught filmmakers in action recording for one of their stories about sustainable living for Happen Films. “After that I rented lots of documentaries and learned more about what was happening in the world,” says Jordan. Fresh from high school and looking for a story to tell, Jordan heard about a plan to build an eco-village in Gippsland, near Melbourne. 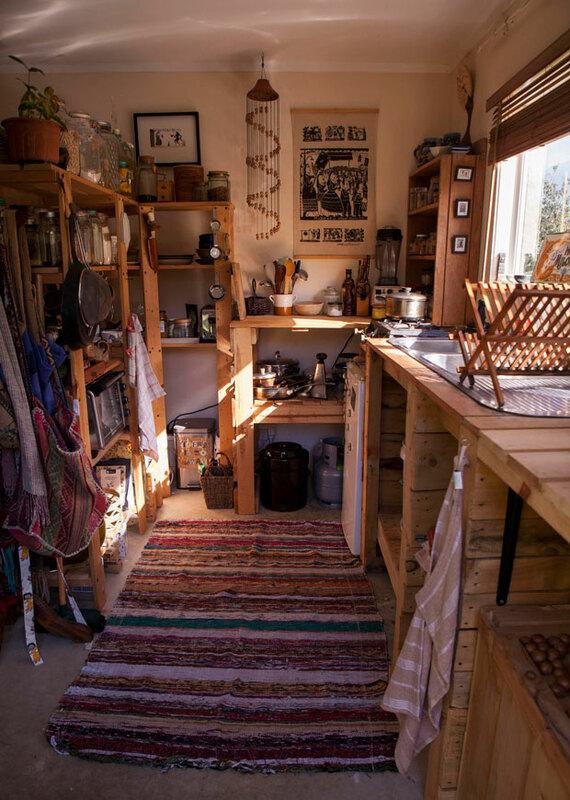 He filmed a week-long workshop during which 20 people worked together to build a 10m2 earthbag house. That short documentary grew into the idea of filming a group living in Gippsland and building a whole eco-village. Participants were called for, 50 people applied and nine were accepted. Among them was Antoinette, who was deepening her search for a better way of living. After nine months’ filming, the result was A Simpler Way: Crisis as Opportunity, and a growing relationship between the duo. 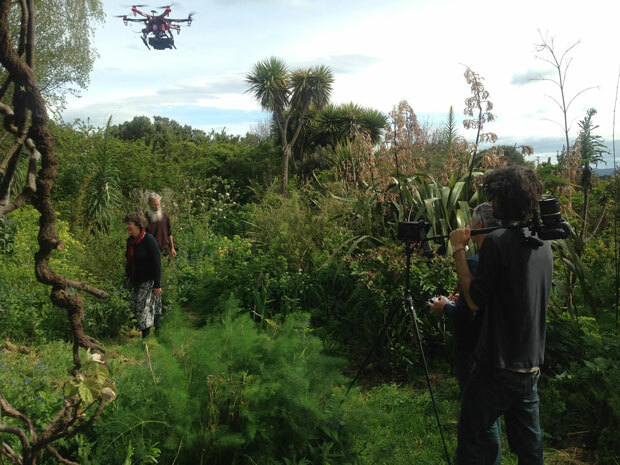 Making films is so much cheaper now, even using hi-tech equipment such as drones, meaning self-funded or crowd-funded filmmakers can tell stories that might not attract traditional funding, such as stories about sustainable and alternative lifestyles. 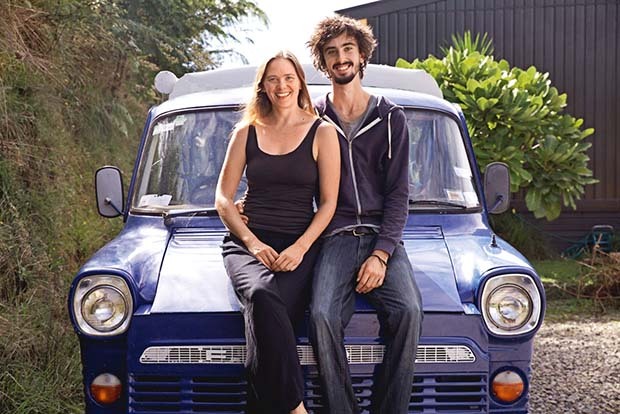 After filming wrapped, the new couple travelled the east coast of Australia to film other communities living sustainably. They then decided to see what stories they could find in New Zealand. In contrast to the documentaries highlighting the world’s problems that had got Jordan hooked on filmmaking, his Happen Films offer inspiration and solutions. 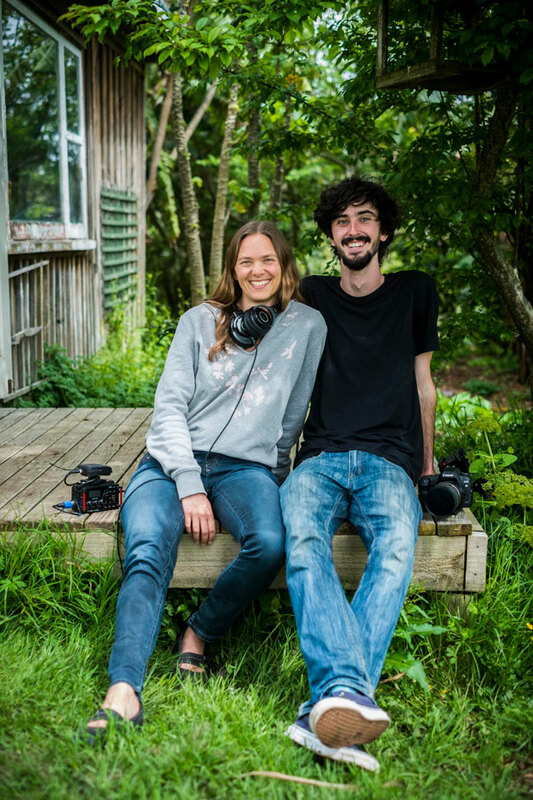 So far the pair have made films about alternative ways of growing food, composting – including human manure – and alternative currencies, such as time banking, as well as quite several about life in tiny houses. “A tiny house is a great solution for some people,” says Jordan, who at 23 says owning a house is unrealistic for most people of his generation. The couple’s car Bluey is currently out of action. “It may be surprising, but you reach a point where consuming fewer resources becomes enjoyable and powerful, and you don’t feel as though you’re missing out,” says Antoinette. “That’s not to say there aren’t conflicts and compromises in our lives too, and things we can do better. We cook on gas, which we’d love not to do. We use a flush toilet, but we’d love to put in a compostable toilet. We grow some food, but not enough. We do buy some plastic. 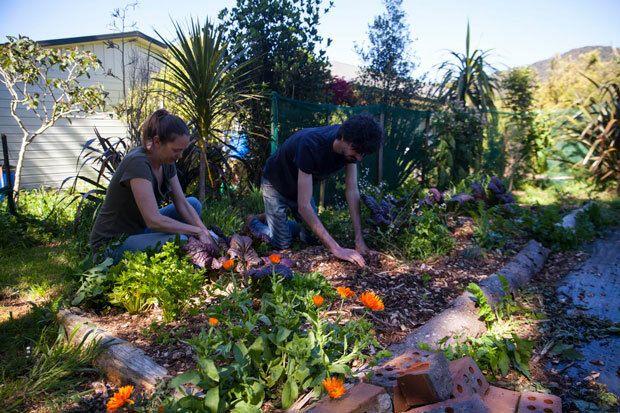 Antoinette and Jordan work in the garden – the pair say they manage to grow some food but would love to more. “There are conflicts and compromises in our lives, too, and there are aways things we could do better,” says Antoinette. While the couple’s footprint is light, they must make some money to fund themselves and their work. Modern technologies have lowered the cost of filmmaking and opened new revenue streams, such as YouTube ads and crowdfunding. “Through our website and the crowdfunding platform, Patreon, our viewers can directly support our films,” says Jordan, who makes a point of thanking donors in the films’ credits. “We would love to earn enough through Patreon to turn off the YouTube ads,” says Antoinette. “The donations and the comments we get give us constant re-enforcement that others find value in the message we’re sharing,” says Jordan. Sharing is what it’s all about, and they’re looking forward to sharing Living the Change with a wider audience early next year. 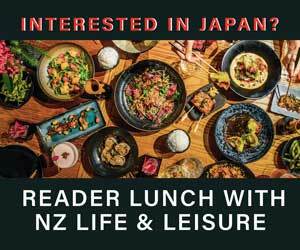 They’ll hold screenings in Tauranga, Auckland, Wellington and Christchurch, then Melbourne and Hobart. From there the film will be available on the Happen Films website. They’d like interested communities to organise public screenings, which would ideally be followed by a discussion sharing what changes people are already making or planning to make. “We want the film to act as a catalyst for communities to have a discussion and get action going,” says Jordan. “Living sustainably, however you can, leads to a life that’s more satisfying through finding out what really matters – community, a non-stressful lifestyle, being connected to food and the natural world.